There’s some damn fine ceramics being made in Australia, and I thought I might start showing you some if it, starting with one of my all time favourites Kirsten Coelho. 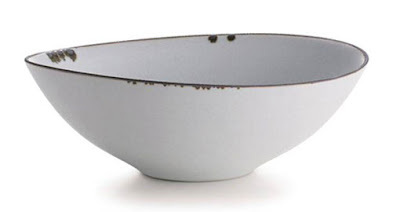 She’s right up there near the top of my Favourite Australian Ceramicists list. This might sound weird (and I hope she doesn’t mind me saying this!) but whenever I see her work I want to hold it to my cheek! 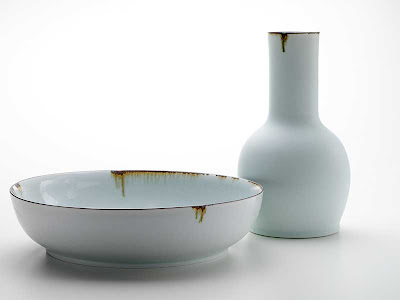 It’s the surfaces…those cool, beautiful glazes...simple, refined, contemporary and just downright beautiful! She's one clever lady. I've been having huge urges lately to get back on the wheel and throw me some pots (its been a while! ), and work like this (and this) inspires me. 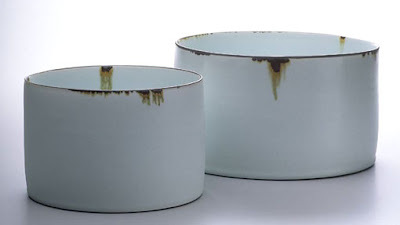 If you’re interested in finding out a bit more about Australian ceramics here’s a couple of links that might get you started - Craft Culture, Journal of Australian Ceramics, Australian Ceramics Blog (via Shannon). if i had one of those beautiful pots in my hands i'd rub my cheek on it too! they make me think of lucy rie's work (a fav of mine!). thanks for sharing!! Hi Diana. Lucy Rie, yum. Kirsten actually did a really beautiful collaboration with two other ceramicists Marie Littlewood and Lesa Farrant called "100 hatpins for Lucy Rie". I'll try and hunt down some images of it to post. It was a stunner. She's one of my faves too, I hate that I left Australia without picking up a piece of hers. I guess another reason to come back!